Massachusetts just got an A- on The State of State Science Standards, a 2012 report released by the Thomas B. Fordham Institute. Although “The Bay State” ranked fourth in the nation, after California (A), District of Columbia (A) and Indiana (A-), the other New England states did poorly: Connecticut ranked 14th, Vermont 24th, Maine 30th, New Hampshire 31st and Rhode Island 33rd. “A majority of states’ standards remain mediocre to awful,” the report says. “The average grade across all states is — once again — a thoroughly undistinguished C. In fact, it’s a low C,” highlights the Foreword to a 217-page state-by-state scrutiny of the science education expectations in physics, earth and space, and life sciences. When contrasting the overall performance between 2005 and 2012, a reality emerges: only 11 states improved their grades, usually from F to higher — but still embarrassing — scores, except for the District of Columbia which went from a C to an exemplary A; 19 states worsen from a B or A to lower grades; and 20 states remained unchanged, half of them around F or D (see complete Table at the end of article). In New England, Massachusetts was “degraded” from A to A-, Connecticut and Vermont remained in C, and Maine in D, Rhode Island decreased from C to D, and New Hampshire improved from F to D (image below). The letter grades corresponded to numeric scores over 10 points; seven for content and rigor of state science standards and three for clarity and specificity. However, the assessment by the Fordham Institute was not about actual performance of students or teachers in physics, earth and space, or life sciences, but exclusively about the science expectations that schools are supposed to meet. Note that the U.S. world placement in math (25th), science (17th) and reading (14th) has been documented in previous studies. A few questions emerge out of the Fordham results: If schools and teachers stick to a “C average” state of science standards, what quality of education are we really offering? 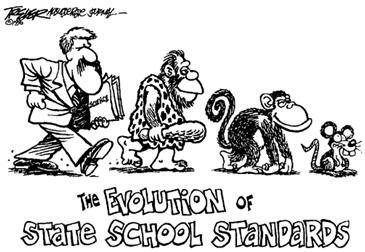 If state science standards guide science education, how do we escape from this loop of poor standards and the expectation to follow them? Shouldn’t science teaching standards actually match the rigors of universal scientific progress? Should self-regulation in school curricula break apart from proper science education in the name of self-regulation? First, the undermining of evolution, a battle not only traceable to the Scopes Trial of 1925, in Tennessee, when the Butler Act (see original document) declared “unlawful to teach any theory, in public schools, that denies the Story of the Divine Creation of man as taught in the Bible,” but currently to the 2012 New Hampshire bill proposals to “require evolution to be taught as a theory, including the theorists’ political and ideological view points and their position on the concept of atheism” or “require science teachers to instruct pupils that proper scientific inquire results from not committing to any one theory or hypothesis, no matter how firmly it appears to be established.” Both bills are hymns to ignorance. Second, vagueness in the statements of expectations about what students should actually learn or be able to do after learning; 29 states scored 1 or 0 in the clarity and specificity score of the assessment, out of three points. Third, poor integration of scientific inquiry, a pernicious malady nationwide; rather than helping students to acquire scientific content through discovery, there is “too much attention to engineering and technology, as well as to “science process skills,” which leads to a technical mind-set where true scientific thinking is lacking.